For the midnight Eucharist Service at St Aelhaiarn’s on Christmas Eve, Caroline used a special temporary altar in front of the rood screen. This created a unique atmosphere for this traditional celebration of Christ’s birth. 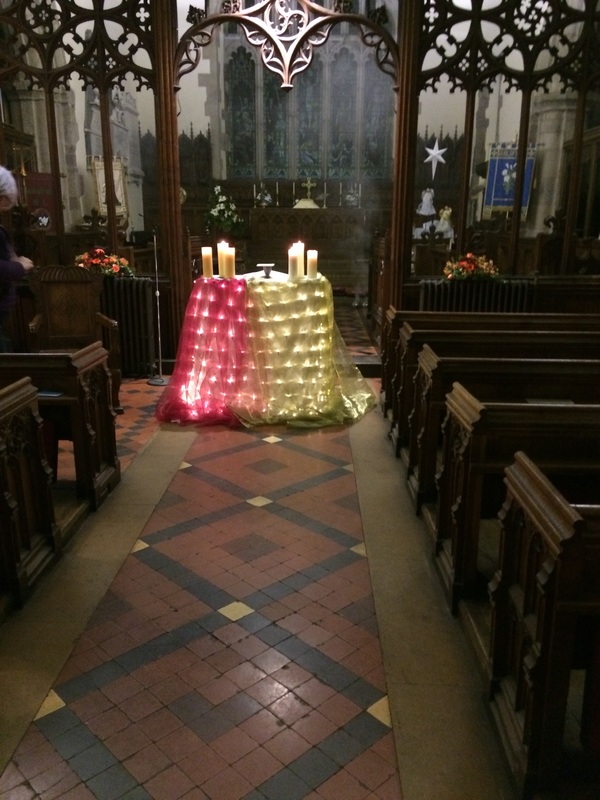 We held our traditional Service of 9 Lessons and Carols as usual on Christmas Eve. The church was full for this popular service with lessons read by the churches, church groups and village youth organisations. In addition to the congregational carols there were carols sung by the choir and a quintet of former Young Farmers, as well as a Welsh carol sung by two youngsters. 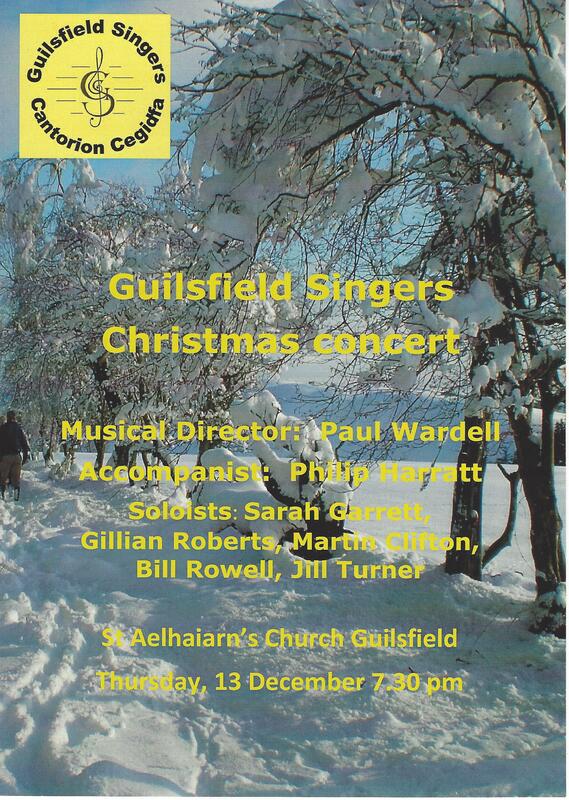 Guilsfield Singers held a very successful Christmas Concert at St Aelhaiarn’s on Thursday 13th December. The Choir, soloists and guest accompanist Philip Harratt performed a range of well known and not so well known Christmas music concluding with a lovely rendition of ‘O Holy Night’. 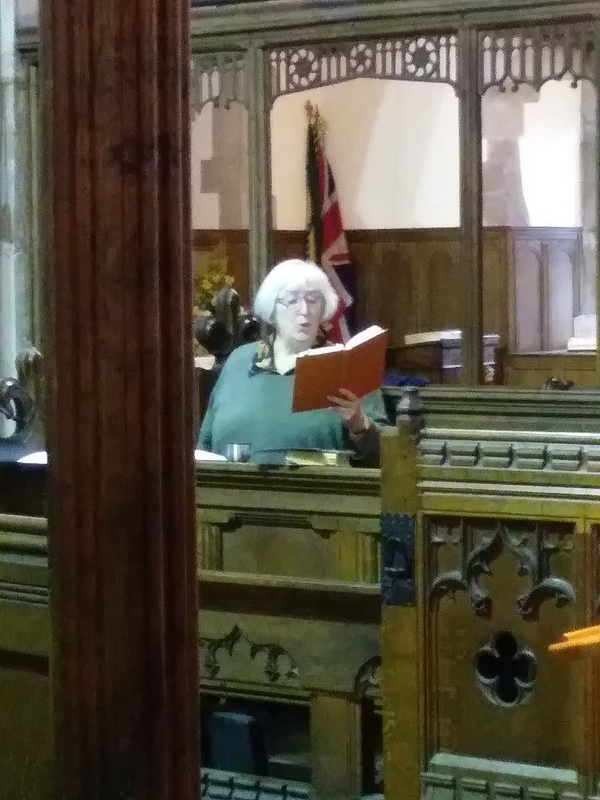 There were also two readings by Jill Turner and Bill Rowell and the audience was able to join with three carols: ‘It came upon the midnight clear’, ‘Good King Wenceslas’ and ‘Hark! the Herald Angels Sing’. The evening concluded with mulled wine and mince pies after the performance. For a little bit of the history of ‘Good King Wenceslas’ and ‘Hark the Herald …’ visit http://www.bbc.com/culture/story/20161220-the-surprising-origins-of-famous-christmas-carols. At our All-Age Family Worship on Sunday 9th December, members of the choir and congregation performed a short play written by JJ on the theme of compassion at Christmas. 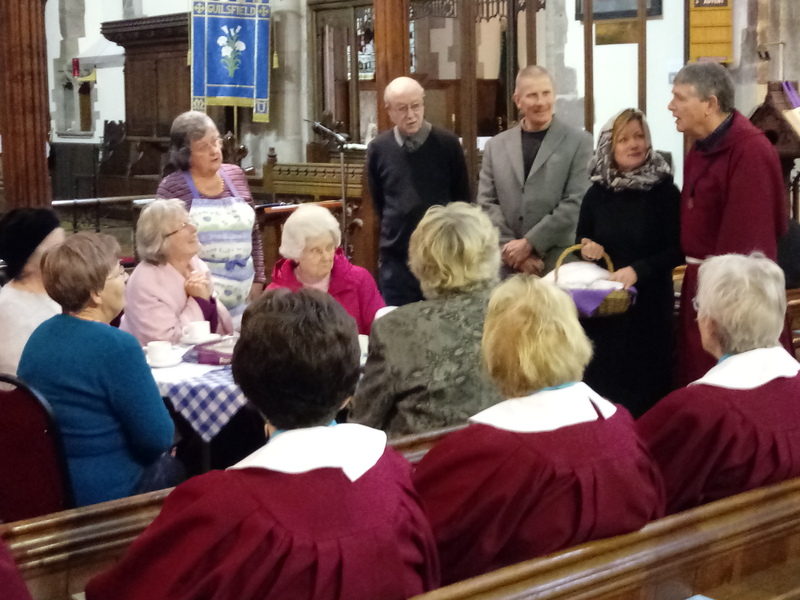 This was enjoyed by all and after the informal-style service we enjoyed fellowship over tea, coffee and biscuits, as usual. Reports and pictures for the events of the Armistice Centenary Remembrance weekend, the ‘Conflict, Reflection and Healing’ evening event and Remembrance Sunday, can be found on the Remembrance Weekend page. A very enjoyable social evening was held in the Old School on Friday 26th October and a short narrative and pictures can be seen on the Social Evening – 26th October page. We held a very successful coffee afternoon in conjunction with Guilsfield Gets Together(formerly Forget-Me-Not Café) on Friday 28th September to raise money for McMillan Cancer Support. See here for more details, pictures and amount raised. We held an afternoon tea Retirement Party for Joan on Sunday 16th September 2018; visit the Retirement Party page for a short report and pictures. For a report and pictures of the Safari Supper held on Midsummer’s Day visit the Safari Supper page. 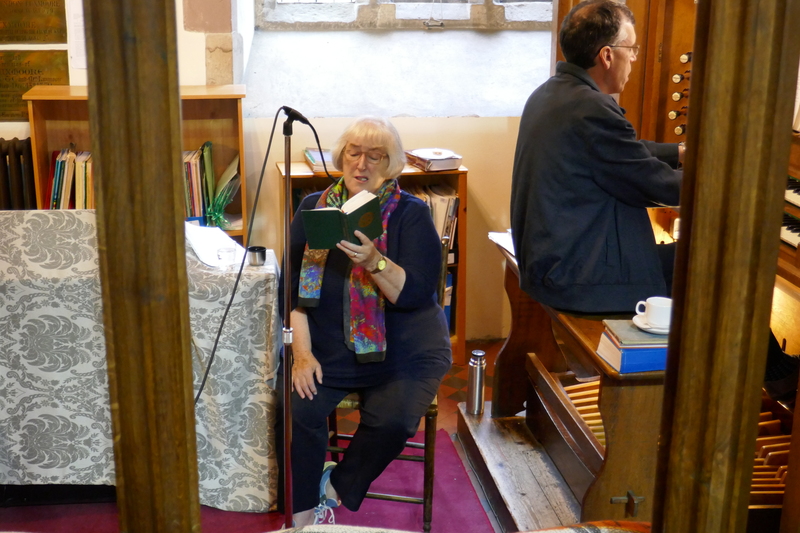 The event was well supported with people attending on each of the days to follow the psalms and in some cases join in. Tea, coffee, cakes and scones were served on the Saturday. We had an exciting and exhausting couple of days on Tuesday and Wednesday 20th – 21st March sharing the story of Easter with the children from Guilsfield School. See Experience Easter 2018 for more information and pictures. A big thank you to everyone who bought copies of the Guilsfield Church Boiler Appeal Seasonal Music Quiz, which raised a total of £386 towards the cost of replacing the boiler. The final result revealed that 3 out of the 56 sheets marked achieved 49 correct answers out of 50. These were placed in unmarked envelopes and the prize winner drawn at the Church Hot Pot Supper on Saturday 27th January. The correct answers and result can be found at the Boiler Appeal Christmas Quiz ANSWERS and Result Sheet. 42 out of the 50 questions were answered correctly on 50 or more sheets received and no question received less than 30% correct answers. Copies of the correct answers can also be viewed in the Church or the village shop window. A very successful Hot Pot Supper was held on Saturday 27th January and a short article and pictures can be found here.